Back on this day in 1956 the second sequel to The Creature From the Black Lagoon debuted. 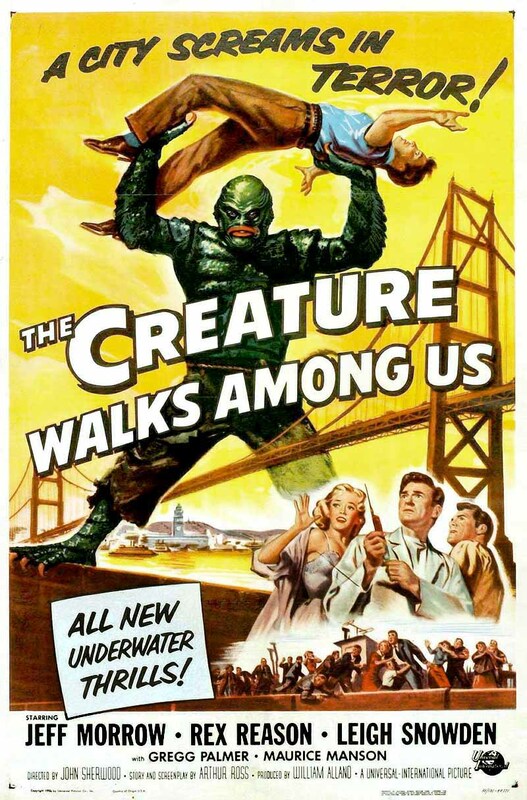 It's long been considered the weakest film in the trilogy, and it's hard to argue this given that they drag The Creature out of the Amazon, burn him in a fire, and convert him into an air-breathing humanoid with no hope of ever returning to the lagoon. But, when viewed today, the film reveals some deeper tones than I'm sure were originally intended. The plot and language of the film can now be taken to speak directly to the hot-button topics of genetic manipulation of animals and foods, and man's destructive meddling with nature leading to accelerated rates of extinction. The movie moves beyond being a simple “monster on the rampage” story and actually has some pointed comments to make about science and politics. It's well worth watching on one of those upcoming hot, humid summer nights.